Thomas Robert Malthus (February 13, 1766 – December 29, 1834) was a British demographer and political economist, best known for his highly influential views on population growth. Malthus is widely regarded as the founder of modern demography. He made the prediction that population would outrun food supply, leading to a decrease in food per person and so to widespread famine. He thus advocated sexual abstinence and late marriages as methods of controlling the population growth. The influence of Malthus' theories was substantial. His theory of demand-supply mismatches, which he termed "gluts" was a precursor to later theories about the Great Depression, and to the works of admirer and economist John Maynard Keynes. Malthus' idea of humanity’s "Struggle for existence” also had a decisive influence on Charles Darwin and evolutionary theory. Although Malthus opposed the use of contraception to limit population growth, his work had a strong influence on Francis Place, whose Neo-Malthusian movement was the first to advocate contraception. Concerns based on Malthus' theory also helped promote the idea of a national population Census in the UK. His writings also were also influential in bringing about the Poor Law Amendment Act of 1834. Malthus has since been proven wrong in his assumption that population growth will outrun the food supply, necessitating population control. Malthus' approach was incomplete, and thus inadequate, but his influence has been significant. As human society becomes more and more interdependent through globalization and technological advances, the need to satisfy both the physical and spiritual needs of all people is of paramount importance. While not finding the answers, Malthus nonetheless raised awareness of the need to balance population growth with the needs of that increasing population. Thomas Robert Malthus was born on February 13, 1766, in Dorking, just south of London, the sixth of seven children of Daniel and Henrietta Malthus. They were a prosperous family, his father being a personal friend of the philosopher David Hume and an acquaintance of Jean-Jacques Rousseau. The young Malthus was educated at home until his admission to Jesus College, Cambridge, in 1784. There he studied many subjects and took prizes in English declamation, Latin, and Greek, but his principal subject was mathematics. He earned a masters degree in 1791, and was elected a fellow of Jesus College two years later. In 1797, he was ordained and became an Anglican pastor. Malthus married Harriet Eckersall, his first cousin once removed, on April 12, 1804, and had three children, Henry, Emily, and Lucy. In 1805, he became Britain's first professor in political economy at the East India Company College at Hertford Heath, now known as Haileybury and Imperial Service College. His students affectionately referred to him as "Pop" or "Population" Malthus. In 1818, he was selected as a Fellow of the Royal Society. Thomas Robert Malthus refused to have his portrait painted until 1833, because of embarrassment over a hare lip. This was finally corrected by surgery, and Malthus was then considered "handsome." Malthus also had a cleft palate (inside his mouth) that affected his speech. These types of birth defect were relatively common in his family. Malthus died in 1834, and was buried at Bath Abbey in England. Malthus' views were developed largely in reaction to the optimistic views of his father and his associates, who was notably influenced by Rousseau; his work was also in response to the views of the Marquis de Condorcet. His famous work, An Essay on the Principle of Population was specifically an attack on William Godwin's optimistic views on the "perfectibility of society." In essence, Malthus was an economic pessimist. The power of population is so superior to the power of the earth to produce subsistence for man, that premature death must in some shape or other visit the human race. The vices of mankind are active and able ministers of depopulation. They are the precursors in the great army of destruction, and often finish the dreadful work themselves. But should they fail in this war of extermination, sickly seasons, epidemics, pestilence, and plague advance in terrific array, and sweep off their thousands and tens of thousands. Should success be still incomplete, gigantic inevitable famine stalks in the rear, and with one mighty blow levels the population with the food of the world (Malthus 1798). His Principle of Population was based on the idea that unchecked population increases at a geometric rate (2, 4, 8, 16, and so on) whereas the food supply grows at an arithmetic rate (1, 2, 3, 4, and so forth). With this assumption, only natural causes (accidents and old age), misery (war, pestilence, and above all famine), moral restraint, and vice (which for Malthus included infanticide, murder, contraception, and homosexuality) could stop excessive population growth. Malthus favored moral restraint (including late marriage and sexual abstinence) as a check on population growth. However, it is worth noting that Malthus proposed this only for the working and poor classes. Thus, the lower social classes took a great deal of responsibility for societal ills, according to his theory. In his An Essay on the Principle of Population, he proposed the gradual abolition of poor laws. Essentially what this resulted in was the promotion of legislation which degenerated the conditions of the poor in England, lowering their population but effectively decreasing poverty as a whole. …this constantly subsisting cause of periodical misery has existed ever since we have had any histories of mankind, does exist at present, and will for ever continue to exist, unless some decided change takes place in the physical constitution of our nature (Malthus 1789). Thus, Malthus regarded his principle of population as an explanation of the past and the present situation of humanity as well as a prediction of the future. Malthus, at least in the first edition of his text, predicted continuing famines in Europe which has been proved false. However, some claim that there is no specific prediction by Malthus regarding the future; that what some interpret as prediction was merely Malthus' illustration of the power of geometric (or exponential) population growth compared to the arithmetic growth of food production. The nature of these checks will have significant effect on the rest of the socio-cultural system—Malthus points specifically to misery, vice, and poverty. Although Malthus' work was strong theoretically, as many critiques later pointed out, the facts have not borne out the conclusions. Nevertheless, his theory of population was highly influential not only in theories of economics but in social policies. Malthus' position as professor at the British East India Company training college gave his theories considerable influence over Britain's administration of India through most of the nineteenth century, continuing even under the Raj after the company's dissolution in 1858. The most significant result was that the official response to India's periodic famines, which had been occurring every decade or two for centuries, became one of not entirely benign neglect: The famines were regarded as necessary to keep the "excess" population in check. In some cases even private efforts to transport food into famine-stricken areas were forbidden. However, this "Malthusian" policy did not take account of the enormous economic damage done by such famines through loss of human capital, collapse of credit structures and financial institutions, and the destruction of physical capital (especially in the form of livestock), social infrastructure, and commercial relationships. The presumably unintended consequence was that production often did not recover to pre-famine levels in the affected areas for a decade or more after each disaster, well after the lost population had been regained. Malthusian theory also influenced British policies in Ireland during the 1840s, in which relief measures during the Irish Potato Famine (1845-1849) were neglected and mass starvation was seen as a natural and inevitable consequence of the island's supposed over-population. Many theoretical and political critiques of Malthus and Malthusian thinking emerged soon after the publication of the first Essay on Population, most notably in the work of the reformist industrialist Robert Owen, the essayist William Hazlitt, and economists John Stuart Mill and Nassau William Senior, and moralist William Cobbett. The highpoint of opposition to Malthus' ideas came in the middle of the nineteenth century with the writings of Karl Marx (Capital, 1867) and Friedrich Engels (Outlines of a Critique of Political Economy, 1844), who argued that what Malthus saw as the problem of the pressure of population on the means of production was actually that of the pressure of the means of production on population. In other words, the seeming excess of population that Malthus attributed to the seemingly innate disposition of the poor to reproduce beyond their means was actually a product of the very dynamic of capitalist economy—its "reserve army of the unemployed." Evolutionists John Maynard Smith and Ronald Fisher were both critical of Malthus' hypothesis, though it was Fisher who referred to the growth rate r (used in equations such as the logistic function) as the Malthusian parameter. Fisher referred to "a relic of creationist philosophy" in observing the fecundity of nature and deducing (as Charles Darwin did) that this therefore drove natural selection. Smith doubted that famine was the great leveler that Malthus insisted it was. Many twentieth century economists, such as Julian Lincoln Simon, also criticized Malthus' conclusions. They note that despite the predictions of Malthus and the Neo-Malthusians, massive geometric population growth in the twentieth century has not resulted in a Malthusian catastrophe, largely due to the influence of technological advances and the expansion of the market economy, division of labor, and stock of capital goods. Malthus argued that as wages increase within a country, the birthrate increases while the death rate decreases. His reasoning was that high incomes allowed people to have sufficient means to raise their children, such as feeding and clothing them, thus resulting in greater desire to have more children, which increases the population. In addition, high incomes also allowed people to be able to afford proper medication to fight off potentially harmful diseases, thus decreasing the death rate. As a result, wage increases caused population to grow as the birthrate increases and the death rate decreases. He further argued that as the supply of labor increases with the increased population growth at a constant labor demand, the wages earned would decrease eventually to subsistence where the birthrate is equal to the death rate, resulting in no population growth. However, the world generally has experienced quite a different result than the one Malthus predicted. During the late nineteenth and early twentieth centuries, the population increased as did the wages, with the spread of the industrial revolution. Malthus assumed a constant labor demand in his assessment of England and in doing so, he ignored the effects of industrialization. As the world became more industrialized, the level of technology and production grew, causing an increase in labor demand. Thus, even though labor supply increased so did the demand for labor. In fact, the labor demand arguably increased more than the supply, as measured by the historically observed increase in real wages globally with population growth. Equally, technological advances in agriculture dramatically increased food production, allowing it to meet and even exceed population growth. The incidence of famine has consequently decreased, with famines in the modern era generally caused by war or government policies rather than actual lack of food. 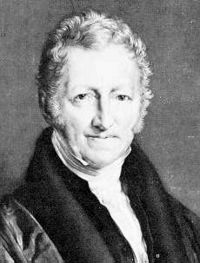 Malthus is widely regarded as the founder of modern demography. Malthus had proposed his Principle of Population as a universal natural law for all species, not just human beings. However, today, his theory is widely regarded as only an approximate natural law of population dynamics for all species. This is because it can be proven that nothing can sustain exponential growth at a constant rate indefinitely. The influence of Malthus' theories was substantial. Among others, he developed a theory of demand-supply mismatches which he called "gluts." Considered ridiculous at the time, as it violated Say's Law which basically stated that supply creates its own demand, his theory was a precursor to later theories about the Great Depression, and to the works of admirer and economist John Maynard Keynes. Malthus has also been admired by, and has influenced, a number of other notable economists, including David Ricardo with whom he maintained a long lasting friendship but opposite thinking on economics. Concerns about Malthus' theory also helped promote the idea of a national population Census in the UK. Government official John Rickman was instrumental in the first modern British Census being conducted in 1801. In the 1830s, Malthus' writings strongly influenced Whig reforms which overturned Tory paternalism and brought in the Poor Law Amendment Act of 1834. Malthus was proud to include amongst the earliest converts to his population theory the leading creationist and natural theologian, Archdeacon William Paley. Both men regarded his Principle of Population as additional proof of the existence of a deity. Ironically, given Malthus' own opposition to contraception, his work was a strong influence on Francis Place (1771–1854), whose Neo-Malthusian movement was the first to advocate contraception. Malthus' idea of humanity’s “struggle for existence” had a decisive influence on Charles Darwin and his theory of evolution. Darwin, in his book The Origin of Species, called his theory an application of the doctrines of Malthus. Herbert Spencer, who coined the term "survival of the fittest," was also greatly influenced by Mathusian notions in developing his ideas that introduced Social Darwinism. Malthus, T. R. 1800. An Investigation of the Cause of the Present High Price of Provisions. London: Printed for J. Johnson by Davis, Taylor and Wilks. Malthus, T. R.  1963. Definitions in Political Economy. Reprints of economic classics. New York, NY: A.M. Kelley. Maddox, John. 1972. The Doomsday Syndrome—An Assault on Pessimism. Bibliography – List of Malthus’s works. An Essay on the Principle of Population,—Full-text 1st edition, 1798 in the Library of Economics and Liberty. The International Society of Malthus—The website of the society. Malthus on Man—In Animals No Moral Restraint—Article about Malthus' influence on Darwin, by Robert M. Young. The Massive Movement to Marginalise the Modern Malthusian Message—Article by Albert Bartlett. Theories of Population—Section entitled Criticism of the Malthusian Theory in Catholic Encyclopedia website. History of "Thomas Robert Malthus"
This page was last modified on 11 September 2014, at 16:09.